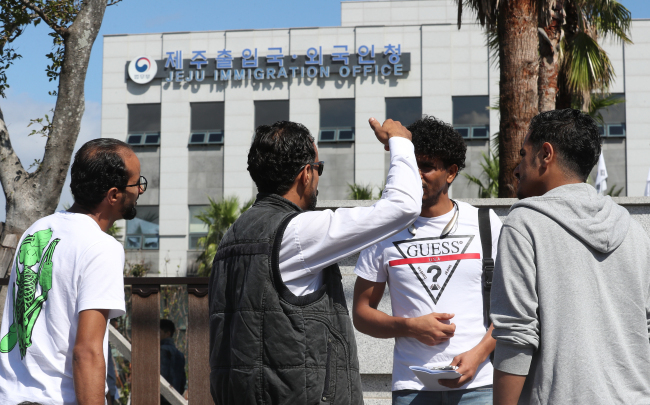 A total of 23 Yemeni asylum seekers – many of them minors -- have been granted a one-year stay in Korea, the Jeju Immigration Office said Friday. The Jeju Immigration Office, however, did not grant legal refugee status to any of the Yemeni applicants. The 23 are among some 500 Yemenis who have arrived on the country’s southernmost island of Jeju since January, fleeing a civil war in their home country. Some 440 of them have applied for asylum status in South Korea and the 23 are the first to receive their results. The status given to the 23 Yemenis -- “humanitarian stay permits” -- are issued when an asylum seeker fails to establish eligibility for refugee status in Korea, but considered to have a need to stay in the country for other circumstances, such as armed conflicts back home and health conditions. To be given refugee status in Korea, the applicant must prove that he is either a victim of past persecution or has a well-founded fear of future persecution on least one of the following grounds: race, religion, nationality and political opinion. None of the 23 Yemenis met the criteria, the Jeju immigration authorities said. Ten of the 23 Yemenis who have been granted right to stay in Korea are minors and seven of those minors entered the country without a parent. Others include a pregnant woman, families with young children and a person who is in need of medical treatment. In response to mounting public criticism, Jeju’s immigration office removed Yemen from its list of countries allowed visa-free entry in May. In April, the office also banned the Yemenis already on Jeju from leaving the Island, preventing them from entering the mainland. With their newly granted permit, the 23 individuals will now be able to live and work outside Jeju Island. They will have to file a separate application by the end of their 1-year stay should they want to remain in Korea longer. If the current situation in Yemen improves and there is sufficient evidence that it is no longer unsafe for the asylum seekers to return to their home country, the permit will be refused, Korea’s immigration authorities said. In July, the National Human Rights Commission of Korea found that at least 32 Yemenis on Jeju were in need of medical attention for ailments including severe diabetes and gunshot wounds. The Jeju immigration authorities are to release the results of the rest of the Yemeni asylum applications by the end of October.